A power of attorney ensures that someone will be there to make decisions for a person when he is no longer able to make them for himself. It is a legal document specifying that a certain person or persons can take certain actions for another person. 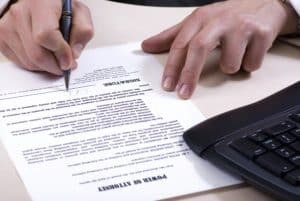 Powers of attorney do not require that an attorney be the person making decisions – it can be a family member, close friend, or other person of your choosing. When an individual with special needs turns 18 years old, under the law his parents no longer have the ability to direct his care and make decisions for him. The individual can designate his parents as the people to make decisions (the “agents”) by executing various types of powers of attorney. Notably, anyone executing a power of attorney must have the capacity to do so – some powers of attorney even specify that they do not go into effect unless the individual executing them becomes incapacitated. Determining capacity (the term used for powers of attorney) may require medical evaluation. Usually, a person executing a power of attorney must understand “(1) the nature of a power of attorney; (2) the effect of signing a power of attorney such as when the power begins and the subject matter over which the agent can exercise control; (3) [that] the power of attorney can be limited or broad; (4) [that] the power of attorney can be revoked so long as the adult child has capacity to do so; and (5) [that] the power of attorney continues even if the adult child becomes incapacitated.” If the person who is to execute the power of attorney does not understand these items, his parents or guardians may want to consider whether a guardianship would be appropriate. Powers of attorney can be very general or very specific as to which powers are granted to the person(s) making decisions. For financial and everyday decisions, Illinois has the Statutory Power of Attorney for Property. This type of power of attorney used for a child with special needs should be modified to include power for the agent to speak with employers, job coaches, agencies providing residential and/or day programs, and the IRS or state tax authorities, at a minimum. Government benefits programs and special education have their own “powers of attorney” that should be executed as well. The state of Illinois has several different types of powers of attorney to consider using: the Illinois Special Education Power of Attorney; the Power of Attorney for the Illinois Department of Human Services, which handles Medicaid; the Illinois Statutory Power of Attorney for Health Care. Parents should consider having their child sign a Mental Health Treatment form as well, which can allow involuntary admission into a psychiatric hospital. On the federal government side, there is the Power of Attorney for the Social Security Administration, which handles SSI.